Item #BR168252 - White Milk Glass Seed Bead Goldtone Domed Vintage Estate Antique Hinge Bracelet. Size: Inside circumference: 6 1/2". Width: 1/2". Beautiful white milk glass seed bead goldtone vintage bracelet! Luscious white milk glass seed beads set neatly in diagonal golden textured channels, sumptuously domed, exuding exquisite luster and shimmer. Hefty, well-made and absolutely elegant. Excellent condition. A fabulous bracelet to wear at weddings, prom nights, pageants, parties, cruises and special functions! US$98.00. 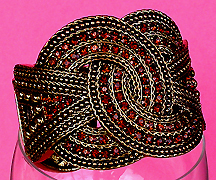 Item #BR168285 - Rainbow Colored Vintage Coil Bracelet. Size: Inside circumference: 8". Width: 1 1/4". This ultra colorful shimmering coil bracelet exhibits every shade of the rainbow! It is done in one continuous metal coil circling round and round to form a gorgeous wide band! The lovely coil has wonderful etching to further exude shimmer, texture and beauty. So pretty! Excellent condition. A fabulous bracelet to wear at weddings, prom nights, pageants, parties, cruises and special functions! US$68.00. Item #BR168269 - Alpaca Abalone Floral Vintage Artisan Cuff Bracelet. Size: Inside circumference: 6 1/2". Cuff opening: 1 1/8". Width: 1". 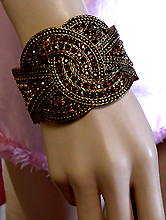 Beautiful vintage cuff bracelet handcrafted by artisans of Mexico. The center has gorgeous rainbow abalone floral inlaid of artistic charm! 'Alpaca' is a Spanish term for marks used in jewelry made of shiny silver-looking durable metal, much like German silver or nickel silver. It has the appearance of silver but no silver is used in the piece. This gorgeous cuff bracelet has an 1 1/8" opening to fit a small wrist. Excellent condition. A fabulous bracelet to wear at weddings, prom nights, pageants, parties, cruises and special functions! US$68.00. Item #BR168342 - Amber Gold Crystal Antique Goldtone Bold Hinge Vintage Bracelet. Size: Inside circumference: 7". Width: 2 1/2" at widest point. Big bold knot design in shimmering amber gold crystals dominating the entire front wrist with gorgeous milligrained thick wide band exuding wonderful texture and style. A well-made hefty vintage piece! New old stock from the 80's. In near mint like-new condition. A fabulous bracelet to wear at weddings, prom nights, pageants, parties, cruises and special functions! US$138.00. Item #BR168267 - Semi Precious Gemstone Pastel Pink Quartz Wide Stretch Bracelet. Size: Stretch bracelet fits any adult wrist. Width: 1 1/2". This lovely wide bracelet is loaded with luscious semi precious gemstone natural quartz of a beautiful pastel pink color! It is lustrous, big, wide and showy, hefty and volumous yet feminine because of the pretty pink color. Lots of elasticity for years of enjoyment and easy to put on or off the wrist. Mint condition. A fabulous bracelet to wear at weddings, prom nights, pageants, parties, cruises and special functions! US$88.00. SOLD. 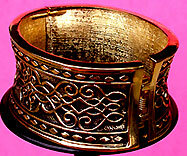 Item #BR168265 - Etruscan Style Goldtone Vintage Wide Concave Hinge Bracelet. Size: Inside Circumference: 7". Width: 1 1/4". The front and back walls of this outstanding vintage bracelet are decorated with raised golden Etruscan scroll designs emphasized by the slightly black enameled background. The walls are concaved to give depth with 1/4" high-polished golden rim to eccentuate thickness. The inside of the walls is gorgeously textured to shine in gold! A beautiful, perfectly contoured, solidly constructed, showy bracelet that has an Etruscan appeal. Near mint condition. A fabulous bracelet to wear at weddings, prom nights, pageants, parties, cruises and special functions! US$98.00. Item #BR168263 - Fushia Pink Aurora Borealis Lucite Bead Vintage Stretch Wide Bracelet. Size: Stretch bracelet fits any adult wrist. Width: 2 1/8". Glistening fushia pink facet beads woven to form a pretty lacey wide bracelet. The beautiful pink lucite beads have Aurora Borealis coating to sparkle like crystal beads. It looks really gorgeous on the wrist! Excellent condition. A fabulous bracelet to wear at weddings, prom nights, pageants, parties, cruises and special functions! US$68.00. SOLD. Item #BR168180 - Damascene Faux Mother of Pearl Goldtone Vintage Link Bracelet. Flaw: A bit of goldtone has worn off in places on the reverse side of the bracelet but not visible in the front. Size: Length: 7 3/4". Width: 3/8". This festive Damascene bracelet has eight links of ornate Damascene motiff accentuating the entire length. The connectors in between each link are bridge style with lustrous faux mother of pearl mounted in yellow goldtone metal. It closes with an insert clasp. Very Spainish and pretty! Excellent condition. A fabulous bracelet to wear at weddings, prom nights, pageants, parties, cruises and special functions! US$78.00. Item #BR168176 - Anne Klein Goldtone Nugget Vintage Antique Estate Bracelet. Designer: Signed ANNE KLEIN � on an oval goldtone metal tag. This beautiful Anne Klein bracelet has gorgeous shimmer and texture! The two glistening strands have chunky rugged golden nugget beads and two golden bars to hold the strands in place. The bracelet closes with a foldover clasp with the Anne Klein designer oval tag hanging proudly next to it. A lovely designer bracelet to cherish and enjoy. Excellent condition. A fabulous bracelet to wear at weddings, prom nights, pageants, parties, cruises and special functions! US$78.00. 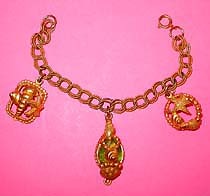 Item #BR16836 - Goldtone Sea Shell And Green Lucite Stone Charm Bracelet. Flaw: Some wear to the chain. This lovely goldtone bracelet has the theme of seashores. Dangling from a textured chain are 3 chunky charms of different shapes. The regular charm (1" x 3/4") and the round charm (1" diameter) have sea shells and star fish. The middle large seashell charm (1 3/4" x 1") is caging a gorgeous green lucite stone. The lucite stone is molded to look like a faceted glass stone. Very pretty. Good Condition. US$48.00. 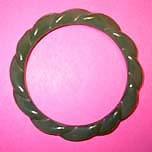 Item #BR16802 - Vintage Lucite Light Green Jade-Look Bracelet. Size: 3 1/2" in diameter. Opening is 2 1/2". This lovely light green lucite bracelet looks like jade. It is translucent, smooth to the touch, nice glossy jadeite color and has curvy moldings adding to depth and interest. One curvy molding overlapping the other throughout the entire bracelet lending a symmetrical swirling effect of simplistic elegance. No chips, no cracks. Excellent condition. US$68.00.